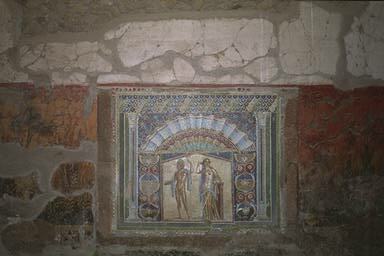 In Pompeii, even the streets were decorated with art. Several street sign mosaics like this one have been found. It is made up of pieces that fit together to make a design. This mosaic is also a tessellation. A tessellation completely fills a space without any gaps. 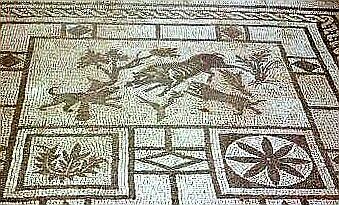 Here are different mosiac images found on the floors throught Pompeii. 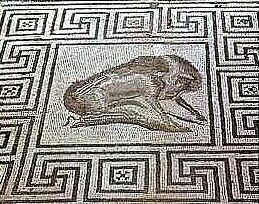 All of the images reflect different aspects of life, and nature, both of which were an important part of Pompeian culture. 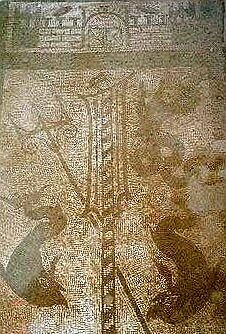 Discovered in the House of Faun was a wonderful mosaic representing Alexander the Great and King Darius of Persia at the Battle of Issus. 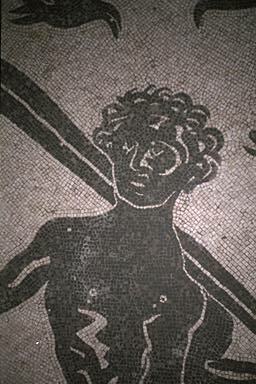 To see and learn more about this mosaic, just click on the image of it here. 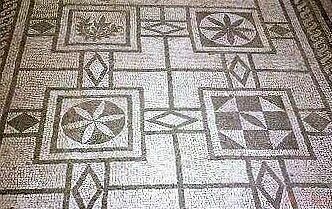 Below is a mosaic that was discovered in Garden Room E of the House of Neptune and Amphitrite, located in the ancient city of Herculaneum, which was also buried by the ash from the eruption of Vesuvius.